Really enjoyed this Saturday just to lie in bed. The hunger has faded, maybe because my stomach is getting used to eating less food, but I am feeling more tired and slept alot today. Feeling completely unmotivated to do anything and feeling like I am on the edge of a possible cold (which I rarely get) so possibly my immune system is a bit weak. Cheated and took some oil of oregano (which is actually quite expensive) cause I really do not want to get sick. Oh ya, and also not feeling very cheery….a bit depressed. 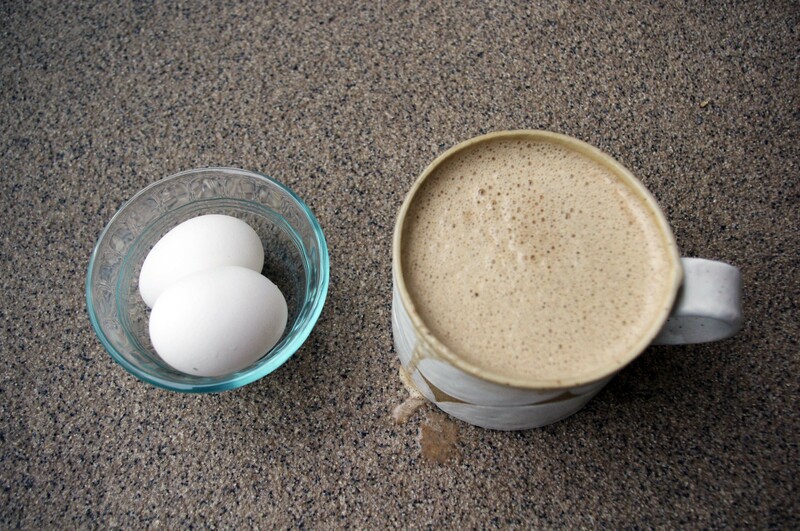 Here is my breakfast – some tea with butter and 3 tables of coconut milk, two eggs for protein. I look forward to a more filling lunch of lentils and rice, a few pieces of broccoli and 1 stick of celery. I have noticed that I am wasting less and even ground up my egg shells and mixed them in my lentil and rice lunch. At the same time, I am feeling very fortunate that I do not live in poverty and can return to a normal healthy diet next week. I feel guilty saying this knowing that for anyone on Income Assistance this is not really possible, but most frustrating is knowing that we can easily remedy this problem. We have created poverty knowing full well that the fix would be relatively easy and affordable in the larger scheme of things. There is ample data to show that ending poverty can actually save us money, no more so than in our health care costs. I have already said that I suffer from chronic inflammation causing pain. At the same time, I am able to stay relatively healthy and in fact, other than a low level chronic pain, I rarely get sick and have been able to more or less work full time and live within a decent enough standard of living. But I know that many people who suffer far worse health issues than I and who are not able to work are staying ill. I have heard from some people who I work with, who have told me that they are getting sicker from the food they eat, namely poor quality, processed crap they get for cheap or as donations. Imagine someone knowing full well that the food they are eating is making you sicker, but also not having the choice because it is all they can get. It is really quite shocking. And even in the few days that I have been on this crappy diet, and as much as I have tried to select healthy food with my $19 (eggs, butter coconut milk, a few veggies, lentils and rice), it is still not nourishing enough and I am already starting to feel unwell. This experience is really showing me the value of healthy food for feeling well, energetic, motivated, and happy. Everyone, no matter what their life situation deserves to feel this way.